My AVEOtsd was shipped via New Zeland Post from Dunedin, New Zealand and arrived in Los Angeles, California one day later. From there, it took an additional 9 days to clear customs and for USPS to deliver the package to my mailbox on the east coast. The total transit time was 10 days from the warehouse to my doorstep. Those on the west coast will likely experience faster shipping times. Upon opening the poly mailer, I noticed that the retail box was a little beat up from the 9000-mile journey that it took to arrive at my home. Luckily, the contents of the package were still intact which included the mouthpiece, a storage case as well as detailed instructions. The AVEO is transparent and is made from a silicone material that’s very soft to the touch. 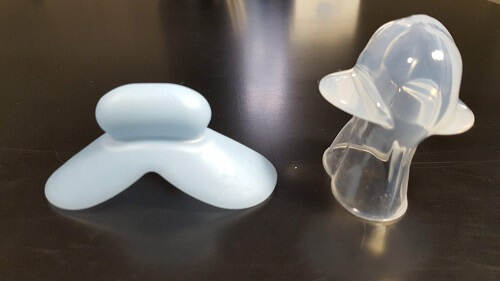 The flange (the portion that goes inside of your mouth) material measures 0.60 mm in thickness and is much thinner in comparison to the blub that rests outside of the mouth. As for overall dimensions, it measures 44 mm wide by 56 mm long. The first order of business was to address the concerns of smell. I noticed a commenter on another website that said that the AVEO smelled terrible. After giving it a good smell, I would have to disagree. The AVEO does not have an offensive odor at all. Unfortunately, AVEO has seen its fair share of counterfeit products over the years. Counterfeiters create a replica of an authentic AVEO using inferior materials which produce off-gassing that can be a risk to your health. The smell produced by off-gassing is strong and is often described as very unpleasant. It’s likely that the person who wrote this comment received a counterfeit product. My AVEO came directly from the manufacturer and smelled just fine. As mentioned in the instructions, I gave my AVEO a good rinse under hot water before putting it to use. The mouthpiece is held in place by suction that’s created by squeezing the air out of the bulb, placing it on the tongue and releasing the bulb which creates negative pressure and draws the tongue into the bulb. It took a couple of attempts to adjust the mouthpiece to the ideal level of suction. At first, I created too much of a vacuum which caused my frenulum to becomes sore after a few minutes. I removed the mouthpiece and did not squeeze as hard when placing it back on my tongue. This time, it was much more comfortable. The key is to find a balance between creating enough suction to hold the mouthpiece in place while not creating too much where it causes discomfort. Once I got the hang of how the mouthpiece fit, I was ready to put it to the test. Before going to bed, I fit the mouthpiece just as I had practiced earlier in the day. I have used a tongue stabilizing device many times before, so the AVEO was not at all unfamiliar. Most who try out a TSD for the first time will notice excessive salivation. Initially, this was an issue for me as well. Despite having used one before, the next morning I woke up laying next to drool-soaked pillow which was pretty gross. The mouthpiece, however, was still attached to my tongue. After removing the AVEO, I noticed some tongue soreness but nothing to be concerned about as it went away within an hour. 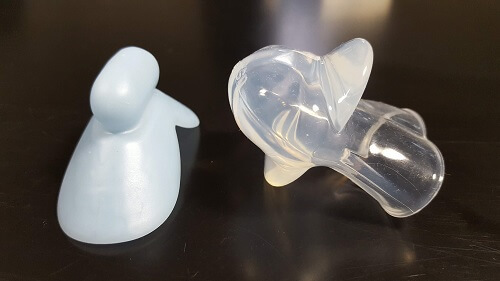 I asked my wife if the mouthpiece resolved my snoring and she said that I slept silently throughout the night which meant that she was also able to get some sleep as well. When testing a mouthpiece, I like to try it out for several days to ensure that there are no issues. I continued using the AVEO for the remainder of the week to ensure that there were no issues with it. I would rinse it off each morning under hot water and allow it to air dry. Night after night it delivered consistent results. The drooling and tongue soreness had subsided by the third night and it was smooth sailing from there. My snoring had stopped and I work up feeling great every morning. 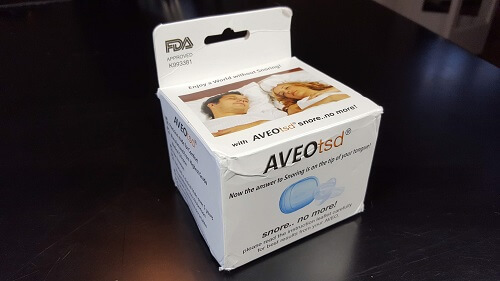 The name AVEOtsd is derived from the Latin word Aveo, meaning “be well” or “fare” and TSD which is an acronym for Tongue Stabilizing Device. 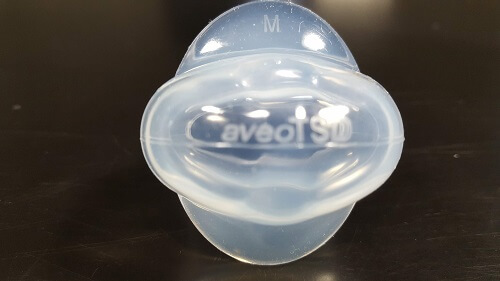 The AVEOtsd is a pacifier-like mouthpiece that’s made of medical grade silicone and attaches to the end of the tongue and is designed to hold the tongue forward while asleep in order to prevent snoring. The mouthpiece was created and patented by Dr. Christopher John Robertson, a specialist in dental sleep medicine and researcher at the University of Otago in Dunedin, New Zeland. In 1999, Great Lakes Orthodontics sent a 510 (k) premarket notification (# K993381) to the US government and received a statement from the Department of Health & Human Resources, giving them the green light to sell the Aveo. You’re probably wondering how such a small product can have such a large impact on snoring. In order to better understand how the Aveo works, you should first take a look at the anatomy of the airway. Despite what many believe, most snoring actually originates within the airway. During our waking hours, the tongue remains in the forward position which makes room for air to travel freely in and out of the airway. While asleep, the jaw and tongue relax and fall towards the airway, due in part to the effects of gravity. The airway can become quite narrow and in some cases closes completely. When this occurs, breathing momentarily stops and this is referred to as an apneic event. A narrow airway creates resistance as air rushes past. The movement of air past a restricted opening will cause tissues to collide with each other, creating the sound that we know as snoring. The obvious solution is to fit a device that holds the tongue in place which is exactly what the Aveo does. But how effective is it? The Aveo has been the subject of at least four different scientific studies between 2002 and 2011. One study 2009 study suggests that the Aveo effectively treated 60% of those with mild to moderate Obstructive Sleep Apnea (OSA) while Another study showed a 77% decrease in Apnea-Hypopnea Index when using the AVEOtsd. There was a time when the only way to purchase the AVEOtsd was through a dentist who would write a prescription and charge you hundreds of dollars. Times have changed and now that the AVEO is being sold direct to consumer, the price has been driven down by competitors who sell similar products. The AVEOtsd comes in both a single pack as well as a twin pack. The single pack sells for $89.00 while the twin pack sells for $139.00. Free air shipping from New Zealand is included. Because they do eventually wear out, you may want to consider buying the twin pack which will save you some money in the long run. Keeping an extra one in your vehicle is also a good idea in the event that you stay the night somewhere other than home and forget to bring your mouthpiece. Will it help with my sleep apnea? Those with obstructive sleep apnea are typically issued a CPAP machine and often feel tied to their machine, taking it everywhere they go and are constantly searching for an electrical outlet. 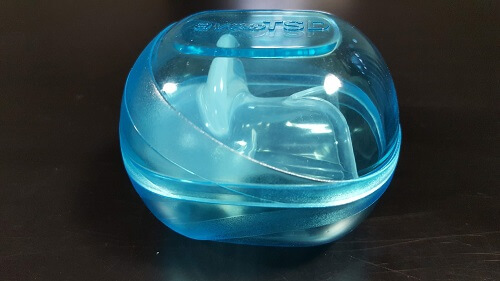 Many sleep apnea suffers have successfully substituted their CPAP machines with a simple tongue stabilizing device such as the AVEO. While this is possible, it is advisable to first speak with your doctor in order to determine if this product is a potential substitute. Your doctor may have you conduct a sleep study with the device in order to determine its effectiveness. What Makes The AVEO Different? Unless you are just now hearing about snoring mouthpieces, you have probably heard of Mandibular Advancement Device (MAD). 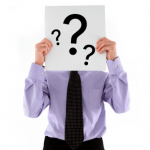 A number of different prescription MAD’s, as well as over-the-counter mouthpieces, exist today. Some popular names include Zyppah, ZQuiet, VitalSleep, and SnoreRX. 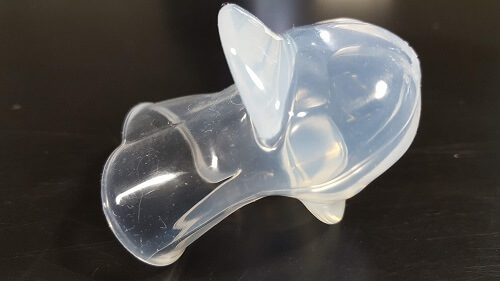 Unlike the TSD which hold the tongue forward, the MAD fit between the upper and lower teeth, similar to a sports mouthguard and holds the jaw forward in order to tighten the airway and prevent snoring. Both types of oral appliances are proven to reduce or eliminate snoring, however, one of the side effects of MAD use is teeth shifting as well as misalignment after prolong use. Since the AVEO doesn’t depend on the use of teeth for leverage, there are no known dental issues associated with the using the AVEO. The GMSS is a popular TSD that was introduced in 2007 by the Canadian based company MpowRx. While Aveo was the first to patent and sell their product to physicians, MpowRx was able to sell their product directly to consumers eleven years before AVEO. While they may look a little different, both products function the same. The main difference between the two has to do with the flange design. The AVEO has a long flange that covers and protects the tongue from biting. If you tend to grind your teeth at night, the AVEO would offer more protection against damaging your tongue. There is a slight price difference between the two. The GMSS sells for $99.94 while the AVEO sells for $89.00 Both prices include free shipping. ZenGuard resembles the AVEOtsd so closely, you just may ask yourself if they are sold by the same company. The answer is no. AVEO has been around since the late 90’s while Zenguard recently entered the scene in 2017. There are a few differences between the two. 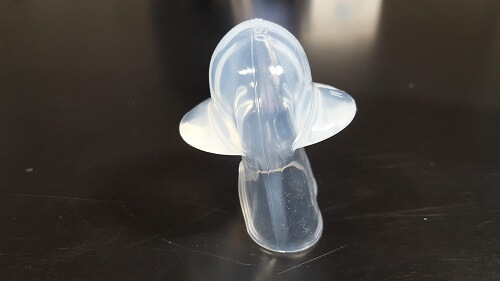 We know that the AVEO is made from Dow Corning medical grade silicone while there’s little transparency when it comes to the type of silicone used in the ZenGuard or where it’s made. Zenguard states that their product is made in an “FDA Approved Facility”. Such facilities do not exist. Manufacturers and distributors of medical devices are required to register their establishment with the FDA each year. The FDA never “approves” a facility. AVEOtsd has been cleared by the FDA and TGA in Australia, Canada, Japan, New Zeland and in the US. As for price, the AVEO sells for $89.00 while Zenguard sells for $97.00. Both prices include free shipping. AVEOtsd mentions that counterfeit products are circulating at a much lower price than the authentic AVEOtsd. These fakes go as far as copying the packaging that the mouthpiece comes in. Lookalikes appear on eBay and Amazon when you type in the term “AVEOtsd”. While they are sold under different private label names, they all come from the same Chinese factory and cost as little as sixty cents each. Is there really a difference? Why not buy the knockoff and save a lot of money? The real difference has to do with the material that’s used to make to make the mouthpiece and the quality controls that are in place. AVEO uses Dow Corning medical grade silicone. While the counterfeits are often said to be made from silicone, the exact composition of the silicone is unknown. This opens the door for potentially harmful chemicals to leach into your mouth when worn. Personally, I wouldn’t risk it. In a clinical setting, the AVEO can be sterilized using a cold sterilant or autoclave. At home, you should rinse the mouthpiece under hot water each morning and allow to air dry. Use a denture cleaning solution once a week to kill off germ and bacterial growth. Do not clean with alcohol-based cleaners such as mouthwash as it will react with the silicone and damage the mouthpiece. The most important question that you should ask yourself before buying is whether or not you can easily breathe through your nose while sleeping. If the answer is “no” or “occasionally” then you may want to consider an alternative product as the Aveo does not allow for oral breathing. If nasal breathing is not an issue then buying the Aveo may be one of the best decisions you ever made. 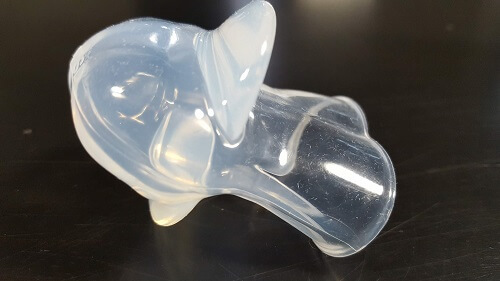 Sure its simply a piece of formed silicone that likely cost very little to manufacture but keep in mind that countless hours of research, product development and marketing adds to the cost. The AVEOtsd has been around for nearly 20 years but is just now being offered directly to consumers without the need for a prescription. While testing this mouthpiece, I found it to be both very effective and comfortable once properly adjusted. After finding the sweet spot, you and your partner will be able to enjoy many nights of snore-less sleep. You will wake up feeling rested and ready to conquer the day. The AVEO works similarly to other TSD while offering the added benefit of a long sleeve which protects the tongue from damage from the teeth. This mouthpiece is competitively priced and gets the job done without side effects such as shifting teeth. Overall, this is an excellent product that is well worth giving a try if you don’t like the idea of using a sports guard style mouthguard or simply want to try something different. Don’t let the seemingly high cost sway your decision. If it stops your snoring problem then it is worth its weight in gold. Ready to use out of the box. No fitting required. Proven to work by extensive clinical studies. Must have the ability to breathe through your nose. Temporary effects such as drooling and tongue soreness may occur during initial use. ZenGuard by ZenSleep Product Review – How Does The Zen Guard Compare? Review of the Pacifier (PAC 100#) Tongue Retention Breathing Night Sleep Aid – How does it compare to the Good Morning Snore? Previous post: Review of VitalSleep snoring solution – Is it really worth the money?